How would you describe where the keys are? Reference objects are used when describing the location of nearby objects, and are used to provide helpful descriptions of the locations of other objects. But how do the characteristics of an object influence its selection as a reference object. Work in our lab has examined how objects that have “good” spatial relationships with target objects effect reference object selection (e.g. 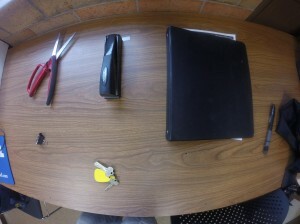 the keys are in front of the stapler). As well as, how perceptually salient features of references objects (i.e. unique color or size) influences reference object selection. One factor we are currently investigating may be what we assume about who we are talking to. For example if the person you are talking to took a piece of paper out of a binder would you assume that they would know what you meant if you said “the ___ are by the binder”.